Powers/Abilities: A surprisingly good fighter and shot. 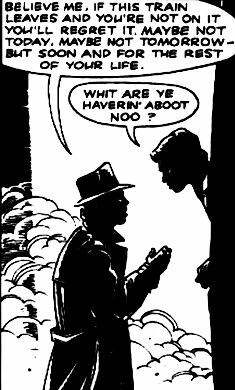 Clunie might also be a reasonably decent detective, but it's hard to say how much of his crimesolving is down to skill, and how much down to his own mad perceptions of a crime existing where there was none to begin with. History: Francis F. Clunie bore an uncanny resemblance to the late Humphrey Bogart, which might have been the initial cause of his obsession with that actor. Coming to believe he was a bizarre amalgam of all the hard-boiled detectives Bogie had played, Clunie would regularly break out of the Scottish mental hospital he was sectioned in, and run rampage on the streets of Glasgow (and occasionally Edinburgh or even Manhattan), leaving chaos and confusion in his wake as he re-enacts plots and solves mysteries from Bogie's movies, working people and events around him into this fantasy - so overhearing crooks discussing stolen Tesco Christmas turkeys becomes a hunt for the Maltese Falcon, and woe betide the first unfortunate "Fat Man" Clunie encounters. Comments: Created by John Wagner, Alan Grant and Robin Smith. After a four issue introductory mini-series released by Fat Man Press, Clunie returned in serial format in Toxic! in 1991, but "Chinatoon" had to be completed by Atomeka after Toxic! was cancelled before the series concluded. Atomeka also released the one-shot Manhattan Project the same year. In 2005 the fourth Bogie Man saga, Return to Casablanca, turned up in Judge Dredd Megazine. 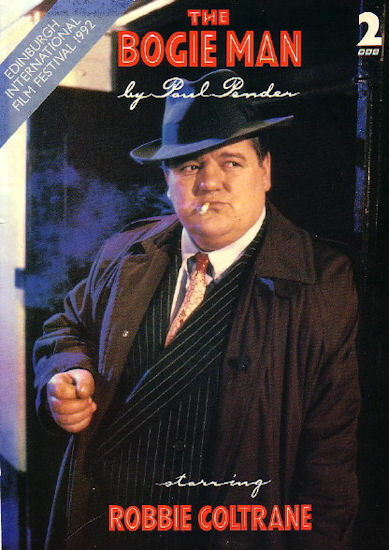 In 1992 the BBC adapted the first comic into a television movie starring Robbie Coltrane as Clunie. Not a superhero, but I have a fondness for this character and it's my site, so he gets included.